This process shows how to open a subform to edit the fields of a grid row in another form. The process consists of two DynaForms. The first DynaForm is entitled "Chemical List" and it contains the "chemicalList" grid, which holds information about different chemicals. text field with the ID "id"
text field with the ID "chemicalName"
textarea field with the ID "chemicalDescription"
text field with the ID "chemicalPrice"
MultipleFile field with the ID "specsFile"
a "submit" button. When this button is clicked, the user is done editing the list of chemicals and will move onto the next task in the process. 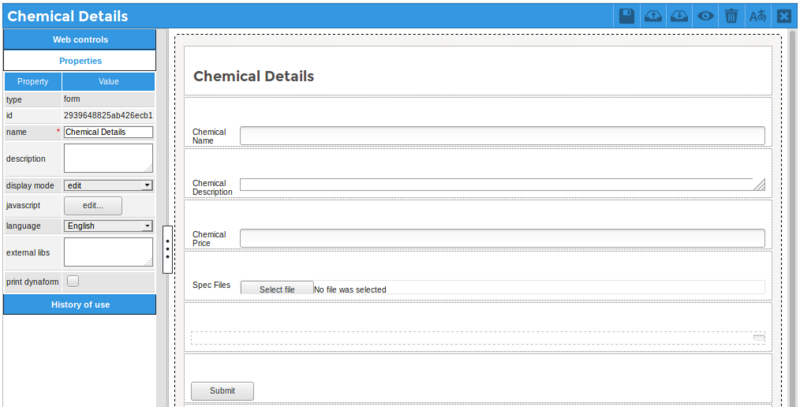 When the user clicks on the "Submit" button in this subform, the data in this DynaForm will be saved in the grid and the user will be redirected back to the first "Chemical List" form to continue editing it. //open the Chemical Details subform. First, this code resets the value of the "submitAction" field to "" (an empty string), so it will not effect the next time the form is submitted. If the grid is empty, then it removes the first row in the grid, which is created by default. If the grid, already had rows of chemicals in it, then the code loops through each row in the "chemicalList" grid and adds a click event handler function to each "edit" checkbox. When clicked, the ID of the clicked grid row is set in the "submitAction" field and then the DynaForm is submitted. 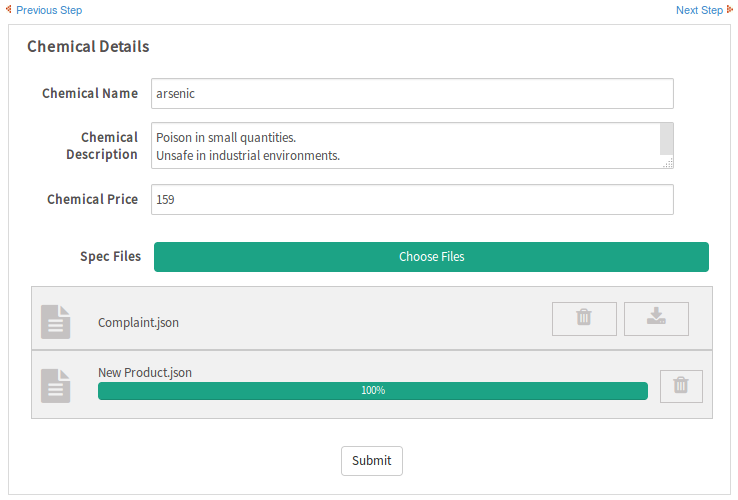 A subsequent trigger will use the value in the "submitAction" variable to find out which grid row needs to be edited in the "Chemical Details" subform. If the @@submitAction variable is empty, then the user clicked on the "Submit" button, so the user wants to stop edit the list of chemicals. On the other hand, if the @@submitAction variable is not empty, then it has the ID of a grid row that needs to be edited in a separate subform. 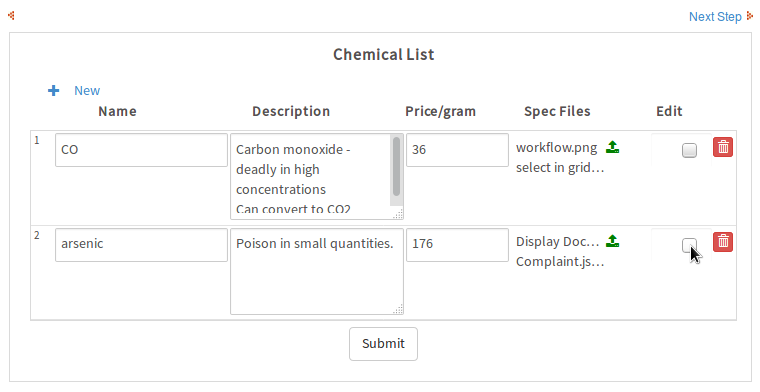 The code loops through the @=chemicalList grid to find the row with the matching "id" field and then transfers the values from the grid row to the variables used by the "Chemical Details" form, so they can edited in the next step by the user. When the user finishes editing the data in the "Chemical Details" subform, then a second trigger entitled "Redirect to Chemical List form" is fired to transfer the edited details back to the "chemicalList" grid, so they can be redisplayed to the user in the first form. The PMFRedirectToStep() function is used to redirect the case back to the "Chemical List" DynaForm, so the user can continue editing the list of chemicals. Note that this function does NOT work correctly in the ProcessMaker Mobile App, so users with mobile devices should access their cases using the "Mobile" User Experience in the web browser of their mobile devices. This trigger code loops through the rows in the @=chemicalList grid variable to find the row with the "id" which is equal to the @@chemicalID field in the "Chemical Details" form. Then, it transfers the data from the edited fields in the "Chemical Details" form to the grid row with the matching "id" field. 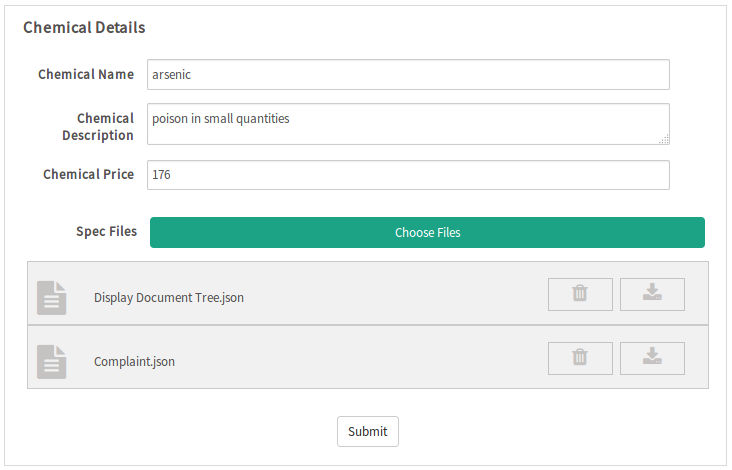 If there are files that need to be transferred from a MultipleFile field in the "Chemical Details" form to a MultipleFile field in "chemicalList" grid, then not only does the array holding information about the files needs to be transfered to the grid, but the database record for each file needs to be updated in the APP_DOCUMENT table in the workspace's database. The AppDocument::Load() and AppDocument::update() methods are used to change the value in the APP_DOCUMENT.APP_DOC_FIELDNAME field in the database from specFiles (which is the DynaForm's field's name) to [chemicalList][row-number][specFiles], which is the field's name in the grid. That way the files will appear inside the grid. This page was last edited on 25 January 2019, at 22:52.